Three days before the biggest fight of his boxing career, Alejandro Jimenez took to the ring inside a weathered, second-floor gym at 28th and Dickinson streets. He threw hooks, jabs and uppercuts, and tried to duck the pool noodles swung at him by his trainer. The sounds of punches echoed off the walls crisply and aggressively, punctuated by the boxer's loud grunts. 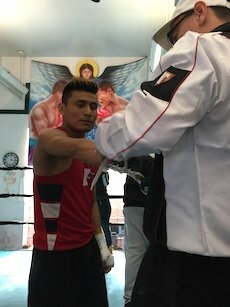 The environment – recognizable in regards to the well-used equipment and old-school boxing photos and promotional posters decorating the walls of the Grays Ferry Boxing Club – wasn’t quite familiar to the 26-year-old bantamweight who boasts a 4-0 professional record, since he trains elsewhere. Then again, nothing about the origin story of New Hope’s first-ever professional pugilist follows much of a script. More so than being a Bucks County standard bearer, the 118-pound Jimenez also represents the hope and dreams of those young adults granted citizenship under the embattled Deferred Action for Childhood Arrivals – or DACA – policy. Though DACA will remain in place at least through the calendar year, knowing he could be forced to return to Mexico, which he fled as a 15-year-old, weighs on Jimenez. It also fuels him, in many ways. During an interview with PhillyVoice after his Tuesday afternoon workout session, he remained focused on the country he loves, and the spirit that drives him to earn his keep in America on behalf of his fellow "Dreamers." His success serves to prove wrong anybody who claims Mexico is not sending its best people to America. "We're going to prove that we belong where we're going," said Jimenez, slated for a six-round fight against Edgar Joe Cortes of Vineland. "I want to win a world title to show other 'Dreamers,' other immigrants, what they can achieve if they keep dreaming and keep working hard." At the age of 15, Jimenez realized that pursuit of a better life meant having to leave his parents and four sisters behind in Oaxaca, a hometown nearly 300 miles southeast of Mexico City. With his brothers already north of the border, he immigrated to America in a fashion dismissed as “the wrong way” by those who want stronger immigration policies. His siblings in America paid a smuggler – or “coyote” – to bring him to America. As Jimenez remembers it, he and seven others walked two days and one night, crossing a river, despite not knowing how deep it was, before crossing over the border into Arizona. The trek meant hoofing it through an intimidating-looking desert. 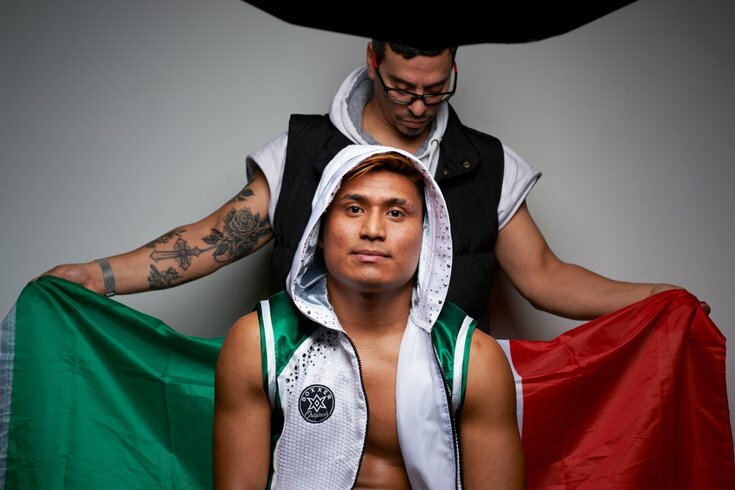 Alejandro Jimenez fought 60 amateur fights in the region but his career was stymied until he was granted DACA status in 2016. He will enter the ring undefeated for his fifth professional fight on Friday night at South Philadelphia's 2300 Arena. Soon, he enrolled at South Hunterdon High School, about four miles across the Delaware River from New Hope in Lambertville, and landed a job as a cook. It was there that his dreams came into focus, courtesy of a boxing gym across the street. Jimenez showed. Again and again and again. The connection between aspiring boxer and trainer would result in some 60 amateur fights across Pennsylvania and neighboring states. Jimenez’s legal status prevented him from traveling to most out-of-state fights and tournaments, including USA Boxing’s Amateurs, so he worked as a sparring partner for several state amateur champions. For his boxing experience, it was good. For his boxing career, though, it wasn't. “I thought about quitting boxing and just continuing to work to help support my family,” he said of not being able to monetize his skills in the ring. That frustration lifted when he was granted DACA status in November 2016. “With DACA, I have an opportunity. Doors opened for me to be in this country,” he said of a program intended to grant protection from deportation for those who came to the United States as children. Mark Roxey wraps Alejandro Jimenez's hands at Tuesday's media day at the Grays Ferry Boxing Club. Fast forward two years and three months, and Jimenez has four professional fights on his record, the first won by knockout and the next three by decision. His opponent on Friday is a southpaw on a three-fight winning streak. 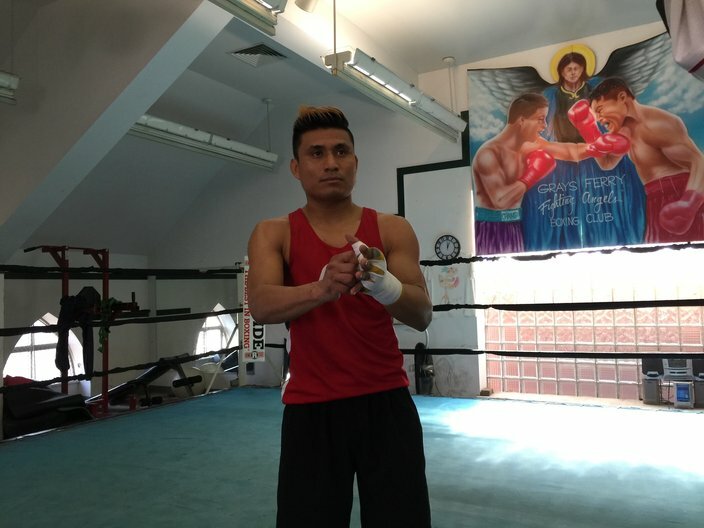 As focused as he is on the sport, he knows he can become a standard bearer, proof that "Dreamers" can give back to their communities – he mentors youth at the New Hope gym where he still trains and is active in his church community – and become hard-working residents. Jimenez admitted that he fears for his future if DACA is rescinded by a president who would reiterate a hard line on immigration issues during his State of the Union address a few hours later. Still, he’s both a "Dreamer" and dreamer now, and he’ll continue to chase them. “It's uncomfortable, but I try not to pay attention to all of that," he said. "Why I came here is because of the opportunities in America, and now I have to take advantage of them. Jimenez is on the undercard for a Friday Night Fights event being dubbed the "Philly Special," at 2300 Arena (2300 S. Swanson St.) in South Philadelphia.